BOSTON, MA, November 17, 2016: If you’re a fan of the television show “Shark Tank”, you won’t want to miss the episode airing Friday, November 18th 9:00-10:01 p.m. EST on ABC Television Network, when Catharine Arnston, Founder/CEO of Boston’s ENERGYbits® www.energybits.com makes her pitch. Will the Sharks eat her alive? Tune in Friday to find out. ENERGYbits® won their coveted spot on “Shark Tank” by beating out 40,000 other entrepreneurs. The competition is stiff since “Shark Tank” is the most watched television show on Friday nights, averaging 10 million viewers per episode. 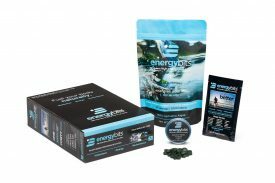 ENERGYbits are at the cutting edge of sports nutrition and sell high-protein algae tablets. Athletes are always looking for ground breaking products that give them an edge and improve their performance ENERGYbits are the answer. For the last six years Olympic and professional athletes and teams have turned to ENERGYbits for their energy and recovery needs and consider them an “insider’s secret” and best “bio-hack”. All this will change Friday when ENERGYbits appear on “Shark Tank” and the rest of world discovers what athletes have known for years. ENERGYbits deliver a performance edge better than anything else. Their plant-based, high protein algae tablets increase physical energy, sharpen mental focus and speed recovery naturally without caffeine, chemicals, sugar or stomach distress. ENERGYbits are 100% organically grown, NON-GMO algae. Their tablets are not only raw and vegan, they are also paleo and ketogenic and this sets them apart from all the other sugar and carb-based sports nutrition products. In contrast, ENERGYbits contain virtually no carbs, fiber or calories- they are just protein, fat and provide steady energy thanks to their forty vitamins/minerals, 18 amino acids, B Vitamins, Iron, Nitric Oxide, Essential Fatty Acids, Ribose (which stimulates ATP simulation) and more. Algae is recognized by NASA and the United Nations as the most nutritionally dense food in the world. It has been used by tens of millions in Asia for fifty years where it is a multi-billion dollar industry. Algae has been sold in the USA for fifty years yet remains virtually unknown. Six years ago, ENERGYbits decided to change this and they have been educating athletes and consumers about algae’s benefits ever since. ENERGYbits refer to their algae tablets as “bits” because they are “dried bits of food” like raisins, and a single serving easily fits into a pocket. The tablets have just one ingredient (algae) and one calorie yet they contain forty vitamins/minerals, more protein than steak, more antioxidants than cherries, more iron than spinach, more beta carotene than carrots and more calcium than milk. With so much energy and nutrition packed into something so tiny, athletes and sports enthusiasts quickly became fans and thanks to “Shark Tank”, the buzz about ENERGYbits has now expanded to health conscious consumers. As the importance of sports nutrition continues to ripple through the athletic community, the attraction of ENERGYbits® clean, green, protein-rich sustainable plant-based fuel is understandable. No wonder sixty Olympic and Pro athletes, like NHL’s Andrew Ference and three-time USA Olympian David Oliver, endorse them and in 2015 they won a national award from Entrepreneur Magazine. In just seconds as you dash to work or the gym, swallowing a handful of ENERGYbits® will jump start your nutrition, energy and greens needs for the day – all without cooking, cleaning or tasting anything green. Will the “Sharks” take the bite and put their money into bits? Tune in this Friday, November 18 at 9 pm/ET to find out. Either way, you’ll learn what insiders already know. ENERGYbits® are a game changer for your life. Visit ENERGYbits to learn more or purchase yours.